Also called "Chinese date". Round-shaped fruits are larger than Lang. Reddish-brown, dry and wrinkled, sweet and chewy (like dates) when fully ripe in early Fall. Attractive, easy-to-grow tree: hardy, drought-resistant, virtually pest and disease free. Requires long, hot summer. Low chilling requirement. Partly self-fruitful, or pollenized by Lang. Also called "Chinese date". Pear-shaped fruits are reddish-brown, dry, wrinkled, sweet and chewy (like dates) when fully ripe in early Fall. 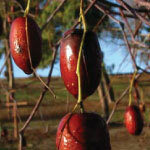 Attractive, easy-to-grow tree: hardy, drought-resistant, virtually pest and disease free. Requires long, hot summer. Low chilling requirement. Pollenized by Li.